If you have images that take up a large space on disk, you can reduce that space even without changing the image dimensions. The best image compression is achieved by using the JPG format, but even if the image is already in this format, you can usually still make it take up less space, as the JPG format has an adaptive compression scheme that allows saving in varying levels of compression. The trade-off is that the less space an image takes, the more detail from the original image you lose. You should also be aware that repeated saving in the JPG format causes more and more image degradation. Since GIMP-2.8, images are loaded and saved as .XCF files. 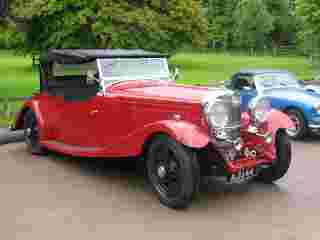 Your JPG image has been loaded as XCF. GIMP offers you to Overwrite image-name.jpg or File → Export As to open the “Export Image” dialog. The dialog opens with the file name already typed in the Name box, with the default.png extension. 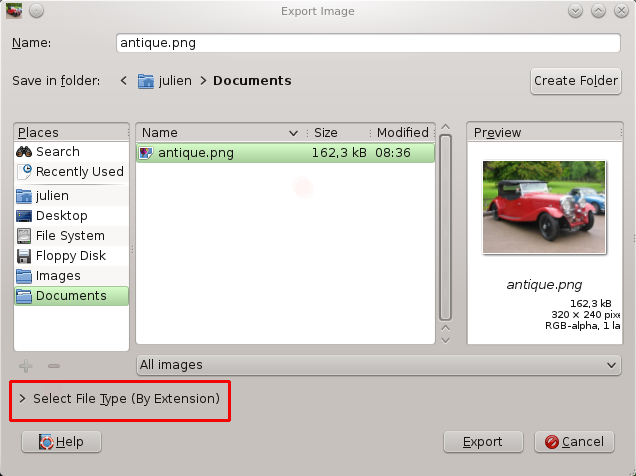 Delete the existing extension and type JPG instead, and GIMP will determine the file type from the file extension. 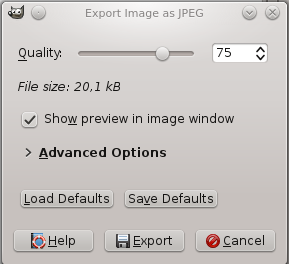 Use the file extension list, red circled in the figure above, to see the types supported by GIMP. The supported extensions change depending on your installed libraries. If GIMP complains, or if “JPEG” is grayed out in the Extensions menu, cancel out of everything and step through the Paragraaf 4.7, “Change the Mode”. Once you have done this, click Save. This opens the “Export Image as JPEG” dialog that contains the quality control. 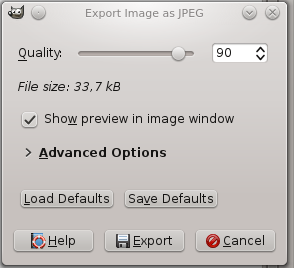 The “Export Image as JPEG” dialog uses default values that reduce size in memory while retaining good visual quality; this is the safest and quickest thing to do. Reduce the image Quality to make the image even smaller. Reduced quality degrades the image, so be certain to check “Show preview in image window” to visually gauge the degradation. A Quality setting of 10 produces a very poor quality image that uses very little disk space. The figure below shows a more reasonable image. A quality of 75 produces a reasonable image using much less disk space, which will, in turn, load much faster on a web page. Although the image is somewhat degraded, it is acceptable for the intended purpose.